• Learn how to tap into a constant flow of ideas that will never leave you wondering what you can sell next using four simple methods that each should take no longer than 7 minutes to grasp. • Discover why your ideas are being stolen as you read this, and how to stop this from happening straight away, before everyone else gets rich from your ideas. • Listen in as I show you exactly how I come up with no less than 5 new viable product ideas every 7 days. I'll show you how can emulate this method quickly, and easily. • Gain the power of hindsight along with the ability to differentiate between the good and the bad of your many ideas. It's easy to know how much money there is to be made in an idea when you know where to look. No beating around the bush, no dodgy untested theories, I'll show you the top 4 proven ways to do this. • I'll show you how to mix with your target market in such a way that you'll be receiving new ideas for products from other people without having to do any of the brainwork yourself that others struggle with on a daily basis. • I won't be leaving you to do this on your own. Oh no, in fact, I'm going to do this with you, showing you how this idea generation method isn't just a theory, but it works in the real world and is in use, churning out scores of new products per year for many online and offline business owners. • Originality is the key. There's too much same old same old nowadays, if you want to make sales, you have to be original. I'm going to reveal to you 4 separate techniques that allow you to create products in such a way, that your target market won't be able to resist you, simply because no one else will be doing what you are. • Success is about evaluating your products and presentation before you even start to sell. The high earners know how to do this already, the ones failing to make sales don't even know that the very product they're trying to sell is the problem, and probably never will. Through a simple product evaluation technique to be used on your ideas, we'll make sure that you're not one of the latter. • It's a little known fact that evaluating the potential of your product is very different to analyzing it's viability inside a specific market. Just because you have a good product, it doesn't mean it's going to make you the most money by selling to the most obvious group of people. We'll show you exactly how you can figure out for yourself where to make the most money out of your ideas. 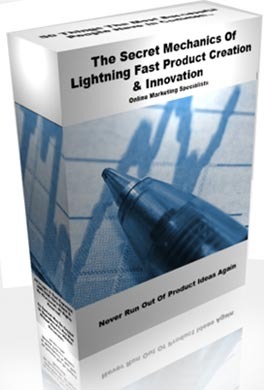 • Avoid the number 1 downfall of online business people trying to create products of any sort. It happens in a flash, it's an unconscious product of the human brain that most don't even know that they're doing, but they are, and it's wreaking havoc on their product creation and idea generation processes. It's easily avoidable however, and with just 60 seconds of practice every day for a week using my methods, you can break out of it for a lifetime, ahead of all the other marketers out there. • Did you know that simply by altering your presentation you can create up to five products out of a single one of your ideas, without recycling content over and over again? What's more, this process takes just a minute or two. How valuable would it be for you to wake up one morning, and by the time you go to bed at night have five products ready to be developed, launched and profited from? I'll show you how I'm doing this every single time I turn my computer on. • How your friends, family and work colleagues create products for you. They do it every day, all you have to do is to be able to spot it and take action before somebody else beats you to it. I'll show you how. • Are you committing business suicide by selecting the wrong products to create? I'll demonstrate to you through a short five step checklist that you can see how your business and your product are going to perform before you've even finished conceiving the idea. Get this wrong, and your business could be headed for disaster. • 5 factors that will determine the success of your business. If you're creating a product and any one of these exists, you're in for big problems later down the line. A simple formula for avoiding the pitfalls is laid before you to stop you wasting your precious time and hard earned cash. • In addition to the above, I'm going to show you how to bring your products to life through information products that people actually read. Did you know that the majority of people won't actually read your stuff? Even if they paid for it. That's a scary thought. What about all that marketing information you're putting out? We'll immediately address how to actually get people to read and take action on your words through your own products. • I'm going to show you exactly what to look for in re-sale products if you want to be a success in this field with some very important points that will immediately tell you whether or not you have the potential to be a success. It's time to stop wasting your money on shoddy products, and get the real deal every time.